Iatrogenesis is the creation of a medical illness or death by the erroneous, harmful, or unintended results of medical treatment, including the use of medication. In the United States, an estimated 44,000 to 98,000 deaths per year may be attributed in some part to iatrogenesis. Weingart SN, Ship AN, Aronson MD (2000). "Confidential clinician-reported surveillance of adverse events among medical inpatients". J Gen Intern Med 15 (7): 470–7. doi:10.1046/j.1525-1497.2000.06269.x. PMID 10940133. When I worked in psychiatric hospitals, one of the most common things I observed was flouridly manic or psychotic patients coming in after taking an antidepressant. Usually it was the first time they had been given an antidepressant, and often it was given to them unthinkingly, by their family doctor. General practitioners very often indiscriminately give antidepressant prescriptions to their depressed patients - without any careful evaluation - perhaps only within a 10 minute routine visit. Their lack of psychiatric experience actually doesn't account for all of it - since even psychiatrists - knowing the risks involved - still frequently prescribe antidepressants to their clients that may have a predisposition for Bipolar Disorder. Usually a psychiatrist in this case will also give another medication, such as a mood stabilizer (Lithium, Depakote, Lamictal) and/or an antipsychotic/anti-mania (such as Abilify, Risperidol, Zyprexa), thinkng that this will mitigate the risk of being on an antidepressant. In medical lingo, this is called "Iatrogenic Illness" or "iatrogenesis," which means medically caused illness. "Iatrogenic causes are the 3rd leading cause of death in America"
Though these ideas may seem radical, this book draws evidence from major, mainstream published studies, including those by the National Institute of Mental Health, and also looks at the skyrocketing rates of psychiatric disability that have literally exploded over the past 30 years, along with the steady increase and popularity of psychiatric medications. 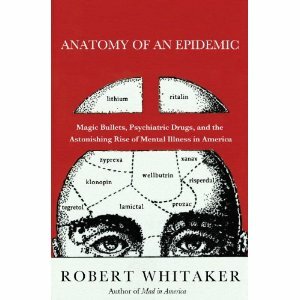 This book is a very lucid illustration of the prevalence of iatrogenesis as the root cause of psychiatric disorders. Iatrogenesis of mental illness can often be avoided by educating yourself about alternative treatments, psychotherapy, and self-help techniques.